1. Cook the onions with some salt and pepper over medium-high heat with olive oil until softened and/or browned, about 5-7 minutes. 2. Add the cabbage and garlic to the mixture. Stir and let cook about 2 minutes. 3. 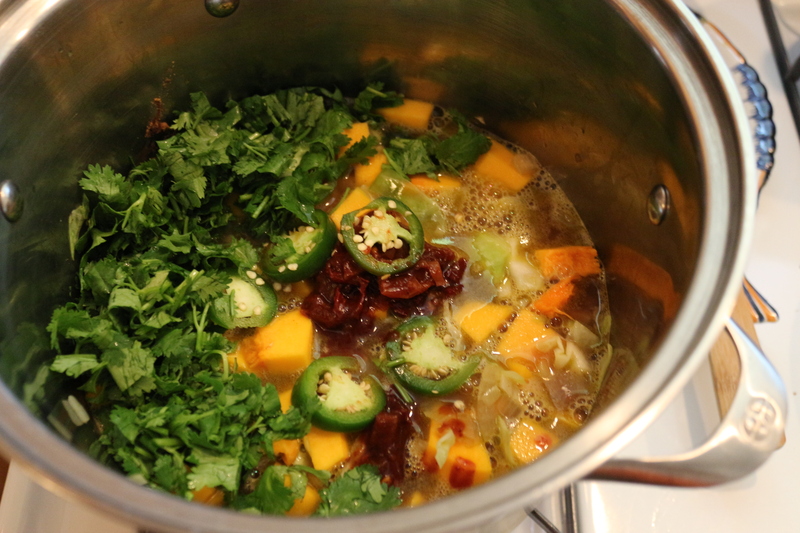 Add the squash, spices, broth, chiles and adobe, cilantro and jalapeno to the mixture. 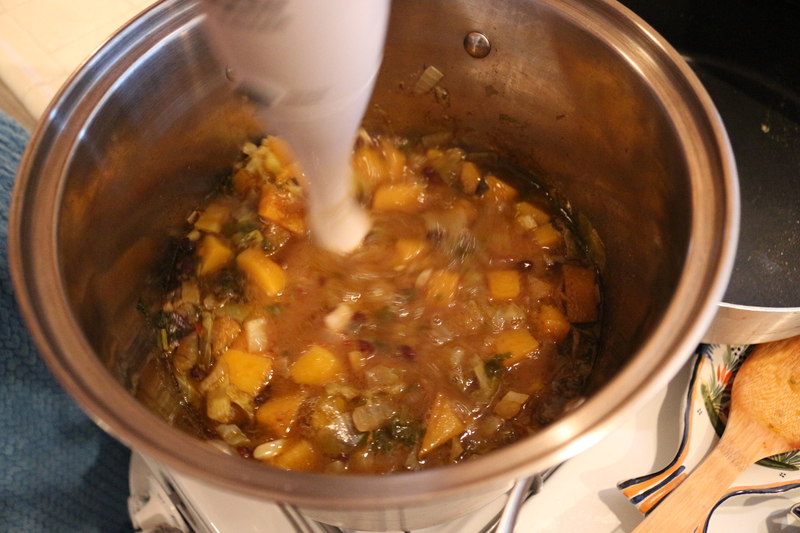 Stir, and simmer about 20 minutes. 4. Add the black beans to the mixture and simmer another 20 minutes. 5. Remove from heat. 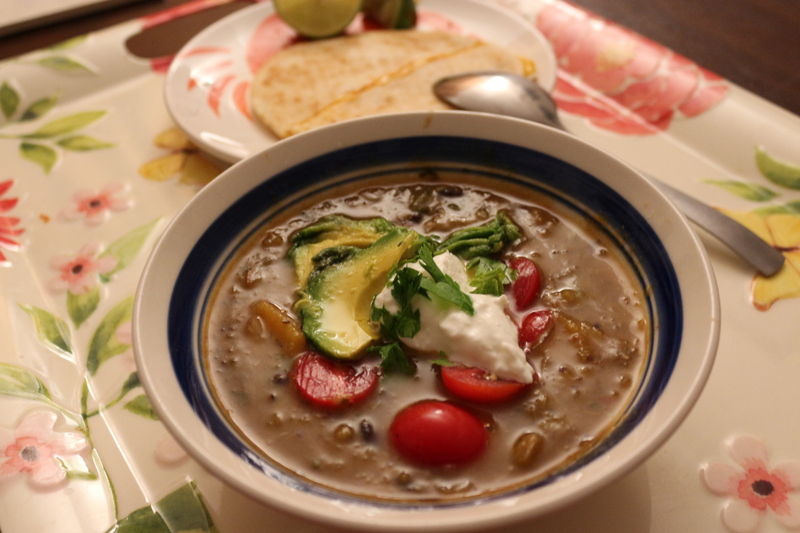 I always think soups taste the best when given enough time to really meld together, so I recommend waiting until the next day to eat this, but you can also eat right away. After cooking my soup a thickened it a bit by pulsing my immersion blender in there. It makes the soup thicker but still keeps it chunky. You can also just add some of the soup to a blender and then mix back into the chunky soup. 6. Top with your favorite goodies, like tortilla chips or strips, avocado, cilantro, green onion, sour cream and/or cheese. This entry was posted in Mains, Soups, Starters and tagged Beans, Gluten Free, Mexican foods, Squash, Vegan, Vegetarian. Bookmark the permalink. I didn’t realize you had so many awesome vegan recipes on this blog! I’m going to try this one this weekend. It looks delicious! Thanks for posting!